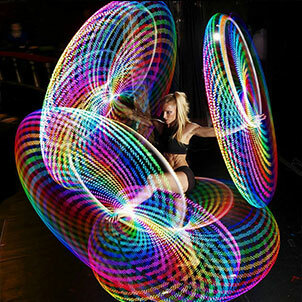 The enigmatic Satya Bella has spent the last ten years spinning in circles and taking the hula hoop to the next level. Having undergone elite training with the Beijing Acrobatic School, Satya combines a unique display of beguiling grace, extreme flexibility and high-skilled multi-hooping to gather more than a few captivating tricks under her belt. Satya has virtually circled her way around the globe, performing in over 42 countries in exotic locales from Lake Tahoe to Beirut to Mexico. For spectacular entertainment at your next festival or private event, stand back and let Satya show you a thing or two. Please fill out the form below to enquire about performances and workshops with Satya Bella, or get in touch via email at info@satyahoop.com.